Fall is official when corn chopping commences. The girls jumped right into freshly chopped corn this weekend as we visited Nathan’s Uncle Dale on a Saturday afternoon drive. Nathan’s cousin Kevin was haying off in the distance. In usual fashion, when given the green light to check out the chopped corn pile, Miss E charged right in and Miss A stayed back a bit more cautious. The day was stunning as is today. 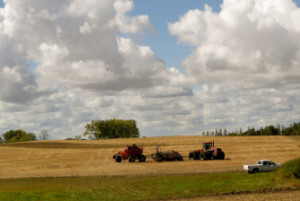 Dale was driving his tractor over the chopped corn to push it down and create a huge pile of it which will be used to feed cattle in the long winter on the prairie. There was a neighbor in his combine across the road chopping Dale’s corn and a truck delivering it to him. Corn chopping is serious business on the prairie. In between loads, the girls checked out the freshly chopped corn pile. It will be compacted down and covered to create silage. The cows are still out in pastures but soon ranchers in the area will be bringing them home before the winter hits. Calves will be weaned. Corn silage and hay will be fed. Last week on our road trip as my friend Val and I drove by thousands of acres of corn and straight through Nebraska where I said my cattleman Grandpa Sonny would say it smelled like “money” as we passed by large cattle ranches and livestock yards. Val laughed at my statement and said “If cows didn’t love corn, we wouldn’t need fences.” Indeed, cows love corn. They go running to it and will jump fences if possible to get to it. Corn silage along with nutrient dense hay keeps cows happy, healthy and fed in the winter. 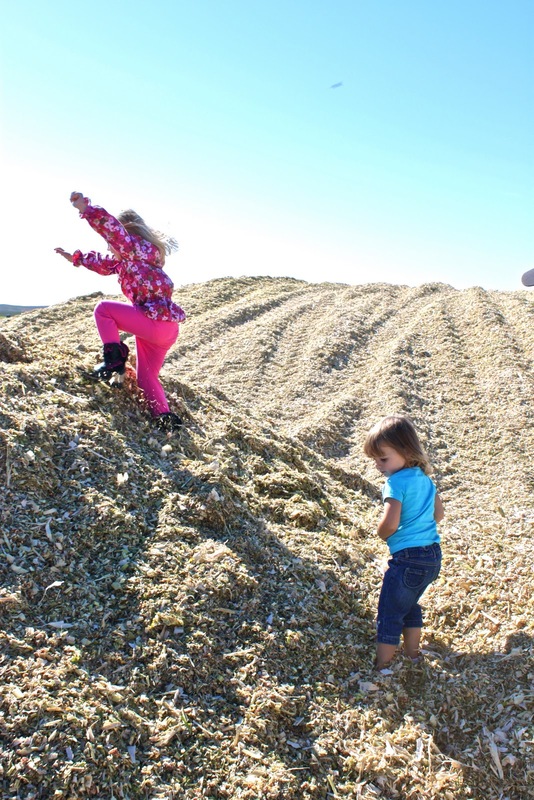 But corn silage in the fall is purely kid entertainment where prairie princesses play. If you are interested in learning more about grass fed versus corn fed beef, I have a few favorite blogs I enjoy where I read about ranching lifestyles plus I learn a lot from them. My California rancher friend Jeff Fowle has a blog post Grain Fed vs Grass Fed that I really liked last winter. Feedyard Foodie is written by Anne. 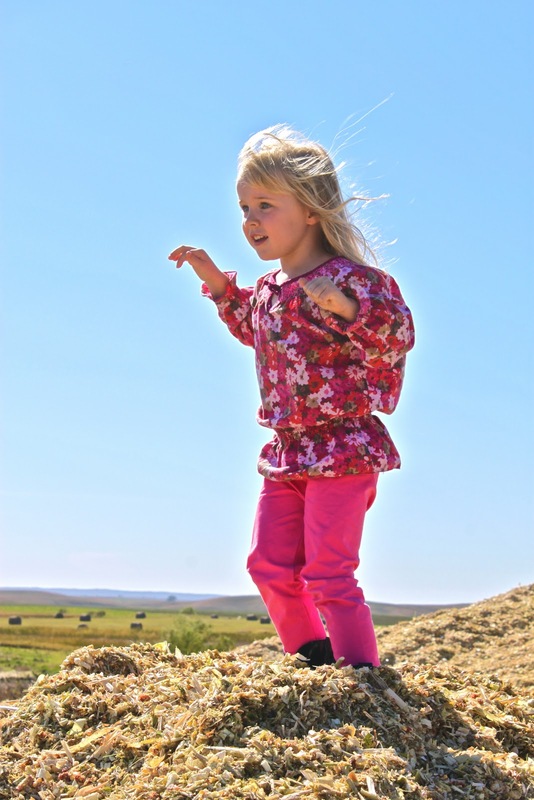 She is a former city girl, an Ivy League graduate and today is a mom of three, wife and feedyard operator in rural Nebraska. My friend Crystal is a fantastic beef resource on Crystal Cattle. Plus she has all things I love on her blog like Turquoise Thursdays. Crystal and I got together a few weeks ago in Kansas City. We have read each other’s blogs for years and it felt like meeting an old friend instead of a random person. Meeting friends with similar interests online and then actually becoming “real” friends offline is one of the most rewarding things about blogging for me. Love your girls. Hi Crystal! Playing in the corn looks like a lot of fun to me! Love the picture of Miss E with the prairie in the background! Wow! That’s all corn?! Impressive. My boys love driving little trucks in the corn crib when we go to the pumpkin patch each year.